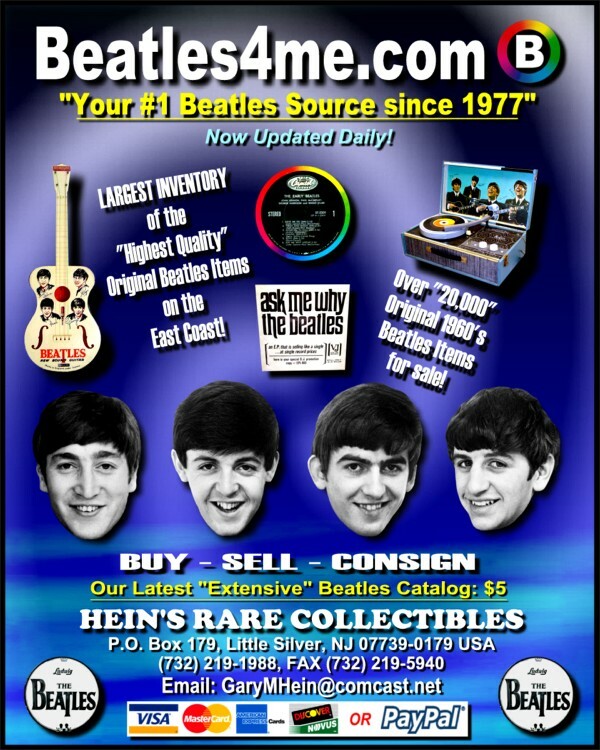 Beatle Information regarding Rare Beatle Collectibles is available at www.Beatles4me.com. On our website, you will find detailed description about our Beatle Merchandise. Where applicable, "counterfeit identification" is provided so that you, the Beatle Collector, can identify Authentic Beatle items from Counterfeit Beatle items. Remember, Beatle Information details are provided for our Beatle Merchandise, our specialty at www.Beatles4me.com. As time permits, we update our website with new Beatles Inventory as it is received. Also don't forget, we Buy & Sell Original Beatl Records, Beatle Memorabilia and Beatle Autographs. Click the link above and come see our "Extensive" Beatles Website, where we list our Beatle Merchandise with detailed Beatle Information!! !